The Times Tables Rock Wrangle is back and this year, we're holding the first event in Bedford. The competition is open to Year 6s and 7s that attend schools with a subscription of TTRS or a trial at the time of the event. Students will compete in a series of heats and head-to-head times-tables-offs to find out who's the Supreme Ultimate Rock Hero For Eternity! The event will take place at Bedford Free School on March 13th. Read more about last year's events here. Teams of 3 in year 6 or 7. Any mix of boys and girls. Special avatar costume, Cineworld and Pizza Hut vouchers and TTRS money! £12 for whole team. Includes entry, VIP pack for each competitor, and team rock photo. A mini-festival including rock photos and maths problems. Important message about arrival and departure. - Please do not arrive later than 14.05pm as there are security and competitor registration procedures to follow. Feel free to arrive from 13.50am. We will aim for everyone to have left by 15.50pm so that you can get back to school in good time. Mathstock will be a mini event that will consist of maths games and puzzles as well as rock photos in front of a green screen with prop wigs and guitars. The Qualifiers are multiplication-only 60 second rounds beginning with just the 2s, then the 3s and so on up to the 12s. The top 16 qualifiers will proceed to the Quarter Finals where they will be split into 2 random groups of 8. Each group has a head-to-head 60 second round, facing identical questions up to 12x12, including division. The top 4 from each group proceed to the Semi Final where the same happens - they are split into 2 random groups of 4. 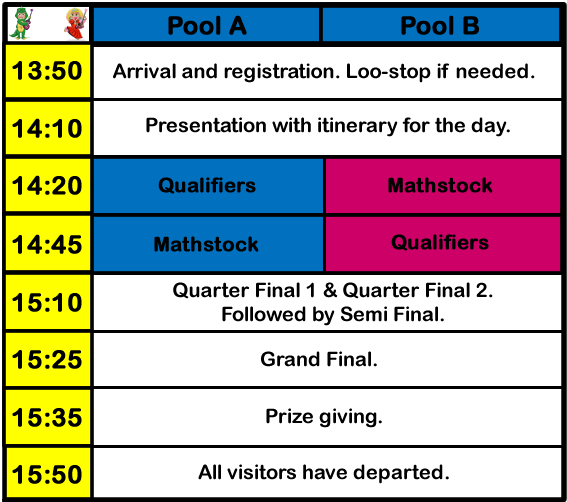 As with the Quarter Final, the Semi Final is a 60 second head-to-head for each group. The fastest three will proceed to the Grand Final. The Grand Final is a 3 minute head-to-head and the winner is the one who has correctly answered the most questions. In the event of a tie, the winner will be the one that has incorrectly answered the fewest questions and if there is still a tie, we will repeat the 3-minute battle! Enter your email address on the Register page. New school users can take out a subscription and book the Wrangle entry at the same time via the New Schools page. Remember, places are limited and schools may only enter one team. There are limited school places and each school can only send one team of three students. Students must be in year 6 or year 7. The competition is open to TTRS subscribers and trialers but your trial must be active on the day of the event. You can register from your Subscription Details page. Prizes include a TTRS swagbag given to all competitors, certificates, TTRS coins and of course the grand prize of a £50 Pizza Hut voucher and a £30 Cineworld Voucher. Will this be in the press? Maybe. We're in the process of contacting local papers and news stations. If your school has links to a newspaper, by all means make contact but please let us know. The event will be hosted at Bedford Free School on Cauldwell Street. This is a very exclusive gig and spaces are so limited that we won't be able to invite parents along. We will be filming the event so you'll be able to watch it afterwards. What do I need to do to enter a team?